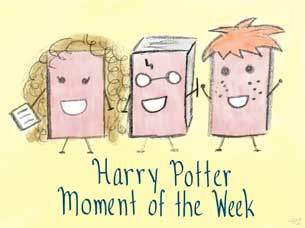 Harry Potter Moment of the Week is a meme hosted by Uncorked Thoughts. The aim of this meme is to share with fellow bloggers a character, spell, chapter, object or quote from the books/films/J. K. Rowling herself or anything Potter related! A list of upcoming topics can be found here. Just for her name alone, I'm choosing Professor Grubbly-Plank, the substitute Care of Magical Creatures teacher. I'll always remember her for tending to an injured Hedwig in Order of the Phoenix, plus she seemed to be a very good teacher (no offense to Hagrid, of course). Professor Quirrell! And that scene in the movie creeped me out big time! LOL her name!! I really like her and the scene where Harry goes to the teacher's lounge when Hedwig's hurt and she's there hanging with McGonagall. Healing Hedwig definitely won me over. Are all the DADA teachers considered temporary? I guess mine would be Lupin then for sure. I hope you are having a wonderful New Years :D Jaclyn @ JC's Book Haven. I was wondering the same thing- if the DADA teachers were considered temporary. In that case, I totally would have chosen Lupin, too; he's definitely one of my favorite teachers and characters. I hope your new year is going great, too, Jaclyn! I always loved gilderoy lockhart he was so pompous and vain! I thought his vanity was hilarious! He just had no clue!